History: Although Billy has a superior pedigree (the famous Irish Greyhound, Fortress, on his sire’s side and the equally famous Molotov on his dam’s side) he ran only 38 races and sired one litter of pups. He’s been hanging out on the farm for a while and even had the opportunity to stay in the house for a while. Now it is time for Billy to find a lifetime retirement home. 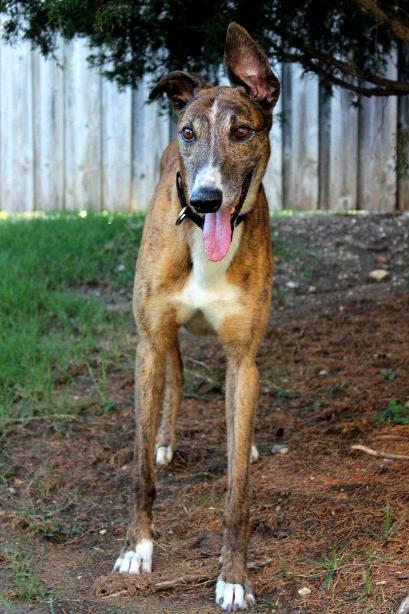 July 15, 2012 update: Billy was adopted to his loving, lifetime home. 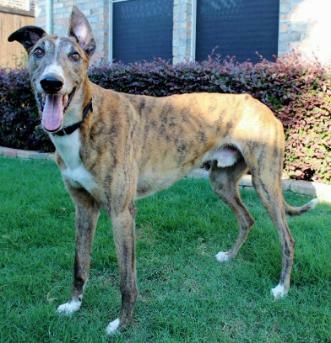 His foster parents just could not give this sweet boy up. 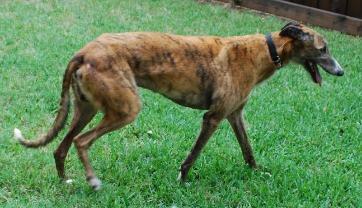 He now has a Greyhound sister named Josey. June 22, 2012 update: Billy apparently doesn't know that he's 7 years old because he still has a lot of puppy left in him! He LOVES to play outside with any squeaky toy available. He is part retriever because you can throw the toy for him and runs to go get it and then will bring it right back and lay it on the ground in front of you! He can play for a long time - even out in the Texas heat, it doesn't seem to bother him! Inside, Bill is a dream dog. He enjoys lots of hugs and affection; he will wrap himself around you like a scarf if you're sitting on the floor. He does like to get up and eat in the morning. He enjoys his food! He will get up and rest his head on the edge of my bed and stare at me until I get up. It's not too bad waking up to his sweet face. Bill gets along with everyone in the house including our Italian Greyhound, our female Greyhound, and 2 kitties. 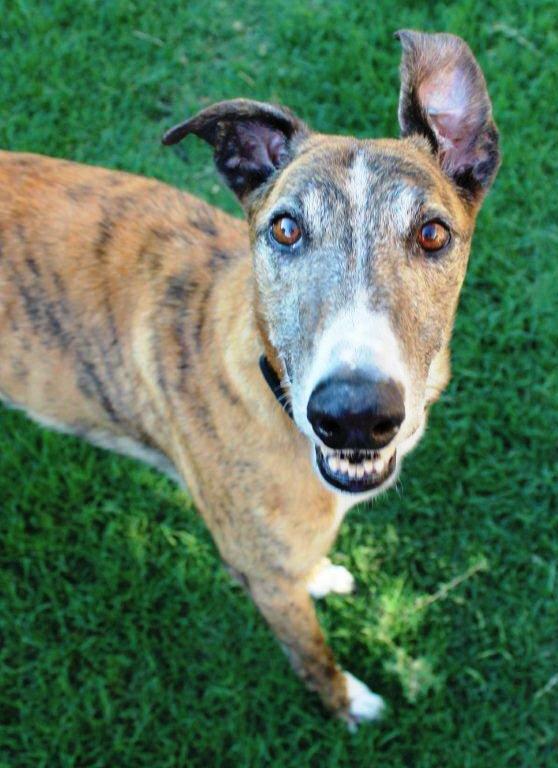 "Bill" would love another greyhound to play with him when he's playing with squeaky toys in the living room, but would also work well as a only pet. He definitely fits the "Velcro dog" description, as he likes to follow us everywhere in the house. He wants to be with his humans all of the time. Bill goes easily into his crate and proceeds to cockroach in there and take a little nap until someone comes to get him. 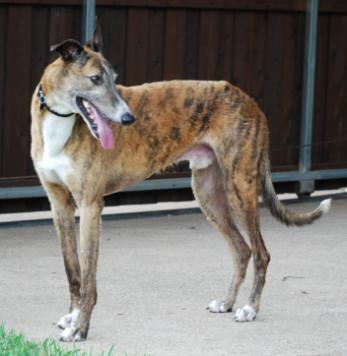 If you're looking for a sweet, affectionate greyhound, Bill is the one for you! He is an exceptional companion. 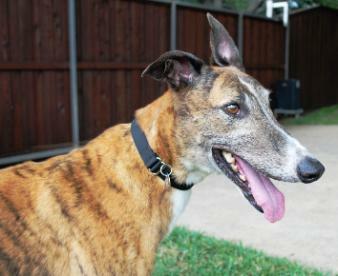 June 6, 2012 update: Billy starting a new life of retirement by coming to TAGS to find his lifetime home.